Life is all about trying new things,and sometimes what you know at present is far more naive than what you might learn afterwards.We by now know wine and food pairing,do we know Scotch whiskey and food pairing,sounds real new isn't it?I know most of us never bother to pair the right food with whiskey,but I personally liked the dark chocolates with the 18 year old Black Dog. Habanero is a place where the food is awesome,everything right from the starters to the main course,to the dessert.I am a big fan and when Akshay and Sumath told me about the Black Dog and the Food Pairing event at Habanero,I was so excited that I left my film making class early to join the fun. Hah,what a relief to see some familiar faces,and some new ones as well.The session started with general "hi wat's up tone",and this time,everyone opened up to their own tales.Every session makes us more free and less formal.That's the beauty,of being in a group event,all thanks to Ginger Claps. Scotch is never boring.If you drink it,and follow no hard and fast,you'd still be happy.But probably more happy if you know whiskey has a smell and a taste of its own.Black Dog has a smell which is fresh,and right from the start you can guess the ingredients,well it's not something you can try making at home,but there are tinge of spices,oak,vanilla and chocolate.The best way to taste whiskey is to add a spoon of water to whiskey,so that the aroma opens,and when you smell it again,it smells more rich.Next is to swish it around your mouth and let it go slow.You would feel the warmth go down the throat,but definitely this whiskey is not heavy and very smooth.Thanks to Mr. Mohit Nishchol for letting us know the right way to have the drink of happiness. butterscotch bordering on cream, with floral nuances that emerges at the end. spreads warmly in the mouth like silent sea waves. Black Dog is a blend of fine whiskies from all the regions of Scotland - Speyside,Islay, Highlands and Lowlands, each matured for a minimum period of 12 years creating a bouquet that captures all the flavours of Scotland, giving Black Dog its very distinctive flavour and taste. vanillic sweetness with whispers of soft peatiness in the background. sweetness with teasing light warm peat. fanfare. The aged malt whiskies from the Speyside valley make their own inimitable contribution by adding that distinctive charm and finesse. Velvet and smooth. The hand of time in the finest sherry wood has weaved its magic spell to perfection. The Black Dog 12 year old has also been awarded a silver medal at Concours Mondial de Bruxelles.Concours Mondial de Bruxelles is an organization recognized by the European Union, which conducts annual competition for various spirits and wines manufactured all over the world. 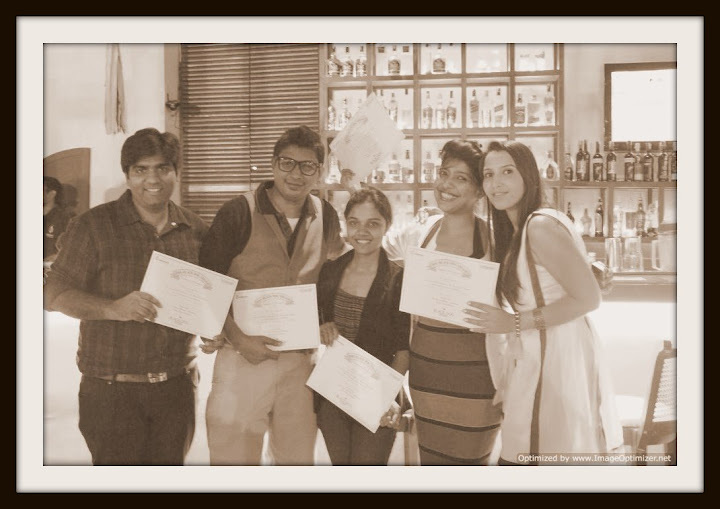 Before this event,I had never tasted whiskey neat,either it had to be with Sprite or Cola.But Black Dog has a taste,which is suited to every palate.Finally we were all awarded a certificate of appreciation,yohoo!!!! We started when it was blue skies around,and now the whole night was sparkling with the golden shimmer of HABANERO and the ever ready bar!It was 7:30pm,time to leave.What a lovely evening! @R-A-J:Ahh..that's because you were sitting right opposite to me :).Thanks for dropping by! Yup, me wanna use it for my blog.. will obviously credit ur post here. But be careful - don't get addicted. Also, the best accompaniment with Neat Whisky is Just Whisky - nothing else to spoil the taste! @Vikram:Thanks for the advice.Well,I am more of a wine person,and that too once in a while.But then it was a Black Dog event and the whiskey tasting session was an important part,so had to.Loved the experience,but of course won't be addicted,my dad will throw me out of my house if I get addicted to something like that.Love your post,it's difficult to write real funny stories and real life experience,but you are very very gud at it.